“Market conditions are changing. The continued rise in interest rates suggests we are in the early stages of a bond bear market, which could intensify as central banks withdraw liquidity. The receding tide of liquidity will start to reveal more rocks beyond what has been exposed in emerging markets so far, and the value of a value discipline will be in avoiding the biggest capital-destroying rocks. If a rock emerges on the crowded shore of U.S. momentum, it could result in a major liquidity challenge, as momentum is often most intense on the downside as a crowded trade reverses. So investors are facing a large potential trade-off right now: continue to bet on the current dominance of momentum and the S&P 500, or bet on change and take an active value bet in names with attractive value and optionality, but with negative momentum,” said Clearbridge Investments in its market commentary. We aren’t sure whether long-term interest rates will top 5% and value stocks outperform growth, but we follow hedge fund investor letters to understand where the markets and stocks might be going. This article will lay out and discuss the hedge fund and institutional investor sentiment towards Ulta Beauty, Inc. (NASDAQ:ULTA). Is Ulta Beauty, Inc. (NASDAQ:ULTA) going to take off soon? The smart money is in a bullish mood. The number of bullish hedge fund positions rose by 2 lately. Our calculations also showed that ULTA isn’t among the 30 most popular stocks among hedge funds. Let’s review the recent hedge fund action surrounding Ulta Beauty, Inc. (NASDAQ:ULTA). How have hedgies been trading Ulta Beauty, Inc. (NASDAQ:ULTA)? At the end of the fourth quarter, a total of 42 of the hedge funds tracked by Insider Monkey held long positions in this stock, a change of 5% from the previous quarter. 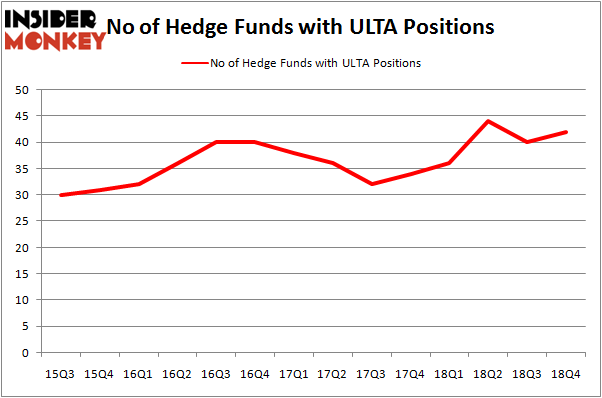 The graph below displays the number of hedge funds with bullish position in ULTA over the last 14 quarters. So, let’s check out which hedge funds were among the top holders of the stock and which hedge funds were making big moves. Of the funds tracked by Insider Monkey, John Overdeck and David Siegel’s Two Sigma Advisors has the number one position in Ulta Beauty, Inc. (NASDAQ:ULTA), worth close to $192 million, corresponding to 0.5% of its total 13F portfolio. Sitting at the No. 2 spot is Renaissance Technologies, led by Jim Simons, holding a $109.2 million position; 0.1% of its 13F portfolio is allocated to the stock. Some other professional money managers that are bullish encompass Ken Griffin’s Citadel Investment Group, Ryan Pedlow’s Two Creeks Capital Management and Brandon Haley’s Holocene Advisors. As industrywide interest jumped, key money managers were leading the bulls’ herd. Suvretta Capital Management, managed by Aaron Cowen, created the biggest position in Ulta Beauty, Inc. (NASDAQ:ULTA). Suvretta Capital Management had $59 million invested in the company at the end of the quarter. Robert Joseph Caruso’s Select Equity Group also made a $23 million investment in the stock during the quarter. The other funds with brand new ULTA positions are Lee Ainslie’s Maverick Capital, Steve Cohen’s Point72 Asset Management, and Andrew Feldstein and Stephen Siderow’s Blue Mountain Capital. 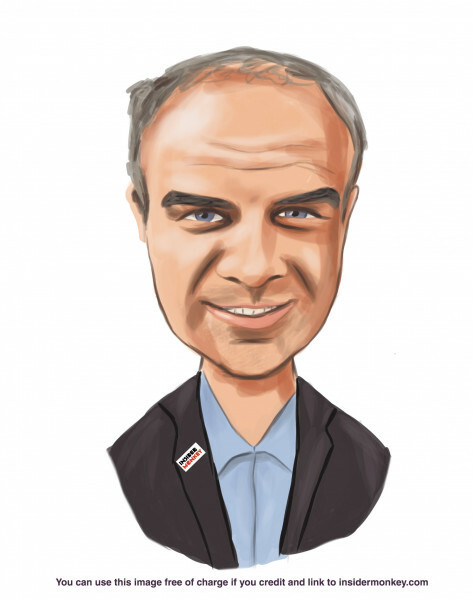 Let’s go over hedge fund activity in other stocks – not necessarily in the same industry as Ulta Beauty, Inc. (NASDAQ:ULTA) but similarly valued. These stocks are Markel Corporation (NYSE:MKL), First Republic Bank (NYSE:FRC), International Flavors & Fragrances Inc (NYSE:IFF), and Loews Corporation (NYSE:L). All of these stocks’ market caps are similar to ULTA’s market cap. As you can see these stocks had an average of 20.25 hedge funds with bullish positions and the average amount invested in these stocks was $546 million. That figure was $1041 million in ULTA’s case. Markel Corporation (NYSE:MKL) is the most popular stock in this table. On the other hand First Republic Bank (NYSE:FRC) is the least popular one with only 15 bullish hedge fund positions. Compared to these stocks Ulta Beauty, Inc. (NASDAQ:ULTA) is more popular among hedge funds. Considering that hedge funds are fond of this stock in relation to its market cap peers, it may be a good idea to analyze it in detail and potentially include it in your portfolio. Our calculations showed that top 15 most popular stocks among hedge funds returned 19.7% through March 15th and outperformed the S&P 500 ETF (SPY) by 6.6 percentage points. A handful of hedge funds were also right about betting on ULTA as the stock returned 38.2% and outperformed the market as well. Here is What Hedge Funds Think About American Airlines Group Inc (AAL) Here’s What Hedge Funds Think About Total System Services, Inc. (TSS) Did Hedge Funds Drop The Ball On Plains All American Pipeline, L.P. (PAA) ? Here’s What Hedge Funds Think About Cheniere Energy, Inc. (LNG) Here’s What Hedge Funds Think About ABIOMED, Inc. (ABMD) Did Hedge Funds Drop The Ball On Markel Corporation (MKL) ?